So what do you have to do? Not much! Just leave a comment on this blogpost and like the Mont Bleu Facebook Page, that’s all! I will announce the winner next wednesday (october 15) on my Facebook and Twitter! 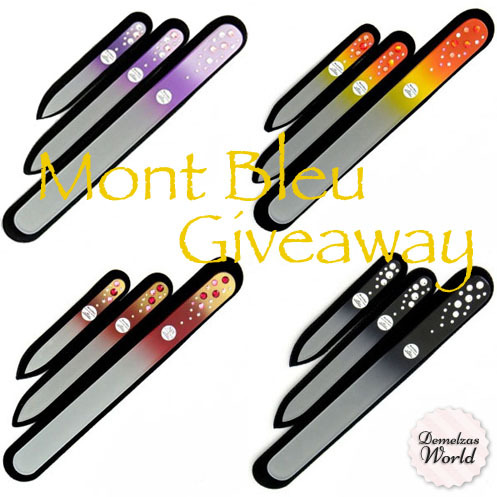 I like your giveaway, Mont Bleu’s glass file has been on my wishlist for quite some time. I like your giveaway. Mont Bleu’s glass file has been on my wishlist for quite some time. Thank you very much for giving your fans an opportunity to enter this contest. I trust the products that you recommend. Liked the Mont Bleu Facebook Page as Irina Dubinskaya-Gnatiuk. Mont Bleu nail filles are of good quality! I love them! Would love to win a set of these files! Thanks for the opportunity! Ooh, these files look amazing! Would like to join this givaway. Thank you so much for the wonderful giveaway! I have never tried glass/crystal nail files, but I hear that they are wonderful. I liked the page on Facebook as Megan Elise. What a fun giveaway, thanks for the opportunity! Thanks for doing this giveaway! I’ve been wanting to try a glass file after hearing other nail polish people raving about them. Wow! Great product! I love the purple set! I heared so much good things about these files, that I definetly like to try them. Thank you for hosting the giveway! Of course I will give it a try!!! i like very much the black one…thank you for this giveaway! I have been dying to try these. Thank you so much for the chance! Hopefully just in time, I’d love to win those awesome nail files! God i hope i win!! Love the purple one!! Hi! I hope the giveaway is still open! My sister and I have bought a nail art brushes set and we watch all your video to learn every time something new! This would be an amazing gift for us! I have never tried a glass file… the more I read about this, the more interested I am! would love to win one of these awesome glass files.. Thanks for the opportunity! Would love to try one of these files! Liked their page.